I made soup the other night and instead of serving boring old muffins, biscuits or that “warm crusty” loaf of bread I decided to play around with my scone recipe. I wanted to make a savory scone, and I wanted it to be flavorful, not boring. They had to compliment a warm mushroom based soup I was serving for dinner which meant they could not be over-powering. I did not have much on hand and was too lazy to run to the store so I used some grated Parmesan to give them texture. Then last minute I went crazy and added some fresh cracked black pepper. Perfect! Have you tried making scones; if so, what is your favorite way to spice them up? Heat over to 350. Line a baking sheet with parchment paper or a Silpat. In a food processor, add the flour, salt, and baking powder, give it a whirl just to combine the ingredients. Feed the butter into the food processor a couple pieces at a time, while it is running. Continue to do so until all the butter is added and the mixture is crumbly. Add the cheese and pepper, give a couple whirls. Drizzle in the buttermilk just until icomestogether. It will be a little crumbly but when you knead with your hands it will come together. On a floured service, knead the dough for a couple minutes, to bring together. Form into a ball and roll into a circle that is 3/4″ – 1″ high, cut the circle as you would be cutting a pie, you should have 6 – 8 sections, depending on the size you like. I go for 8. Place onto the baking sheet. Bake for 20- 25 minutes, until golden. 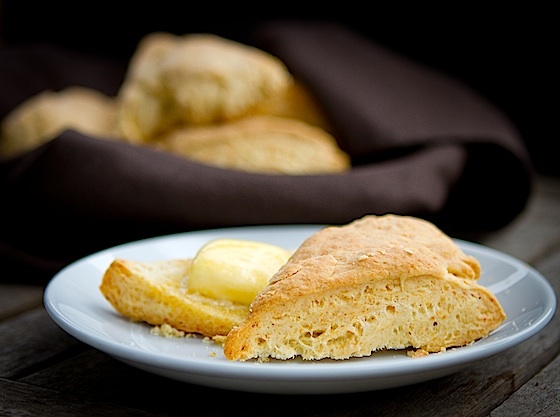 9 Responses to "Savory Parmesan and Black Pepper Scones"
Oh, how PERFECT to serve with soups! Thanks for a lovely recipe. Wow, those are a great option to accompany soup and sound really easy. I'm going to have to try them soon. Yum! I love that flavor combination. Now that I have made savory and eaten my share, I have to say I like them better than sweet. And perfect with soup. I made these tonight and they were wonderful! Fantastic aroma and super easy too. I didn't have any buttermilk so I substituted milk plus a couple of tablespoons of yogurt and it worked just fine. I served them with my roasted potato-leek soup garnished with home cured bacon. Thanks for the great recipe! My favorite scones to make at home are a buttermilk based recipe like yours - but rather than savory they're slightly sweet with crystallized ginger. So, you have that cool of the buttermilk and the heat of the ginger - a very nice combination.